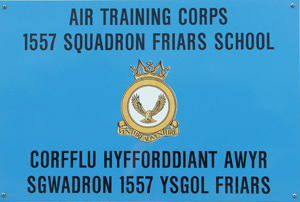 1557 (Friars) Squadron is the local Air Training Corps squadron for Bangor, North Wales. The squadron is situated between the Menai Straits and Snowdonia on Friars School's grounds. This is an excellent location and enables us to offer a variety of activities to our cadets. Our Squadron was once part of Friars School, and takes its name from the school but is now detached and anyone may join. Anybody aged between 13 and 17 (boys and girls) can join our squadron. You don't need to be interested in aeroplanes or want to join the RAF, but if you do that's great too. As a squadron we meet twice a week at a building dedicated entirely to our use. On parade nights we enjoy activities such as leadership and team building exercises and training in activities such as target shooting and camp craft. Throughout the year, our cadets also get the chance to participate in activities such as hill walking, expeditions, flying, gliding and communications exercises.